Later this month, thousands of people will be coming together in our nation’s capital to demand a democracy that works for all of us – where our votes are not denied and money doesn’t buy access and power. 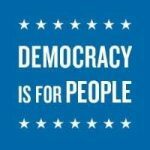 Democracy Awakening includes a day of workshops, a massive rally/march, and visits to Capitol Hill to talk with elected officials. See the full schedule here. WV Citizen Action Group is arranging a 15 passenger van to and from the event, and we’d like to offer you a chance to join us! If you’re interested, please RSVP by Monday, April 11th. Only 11 seats are available, so hurry! See below for more details on the event. If you have any questions or concerns, please contact our Ciera Pennington at 304.346.5891 or ciera@wvcag.org. Other stops along I-79 N can be made upon request; email ciera@wvcag.org to see if we can stop somewhere convenient for both of us and pick you up! *Note: Some groups will be participating in Democracy Spring, a sister action to Democracy Awakening. We will not be participating in DS’s civil disobedience campaign, so don’t worryabout getting arrested! Everything we do at DA will be completely legal. Complete this form. Be sure to indicate if you’ve received permission from Ciera and are being picked up along the interstate rather than in Charleston.